Birthed from small, greenish-yellow grapes that flourish in Germany, Alsace, and Austria's colder growing regions, Rieslings can be sweeter wines, but they also produce a wealth of dry, peach- and apple-tinged offerings. And, they're considered the best white wines for food pairing, so unless you're trying to get slim the Tommy Lasorda way (fast! ), Riesling can only make your dinner that much more enjoyable. To that end, participating Riesling Week restaurants across the city will be offering specials including pairing menus, by-the-glass options, and flights, which, thanks to Riesling's relaxed character, won't be flights of fancy. There'll also be tastings at esteemed retailers, allowing you to sample several options before selecting your favorite (though as Rush once said, "If you choose not to decide, you still have made a choice" -- i.e., buy more than one bottle). 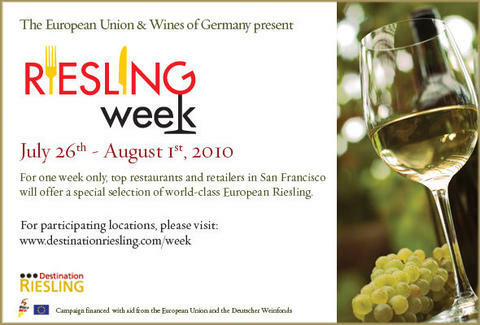 Check out the Riesling Week map of participating retailers for tastings near you.